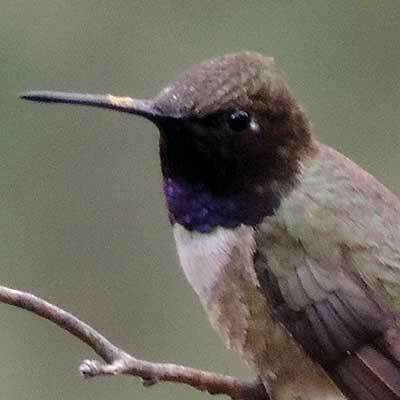 This Black-chinned Hummingbird was photographed by Robert Shantz at Alpine, Arizona, USA, Aug 11, 2005. Male Black-chinned Hummingbirds do indeed appear to have a jet-black throat when viewed from most angles. But if the viewer is at just the right angle a brilliant strip of purple-blue appears along the lower edge. Females are mostly whitish on the chin and breast. The back of both males and females is green. Fairly common in Sycamore woodlands from mid spring through August. Also found in riparian habitats in the Sonoran Desert and ranging into higher montane habitats in Arizona. Fond of hummingbird feeders. The male below has a dusting of pollen on the top of the bill. 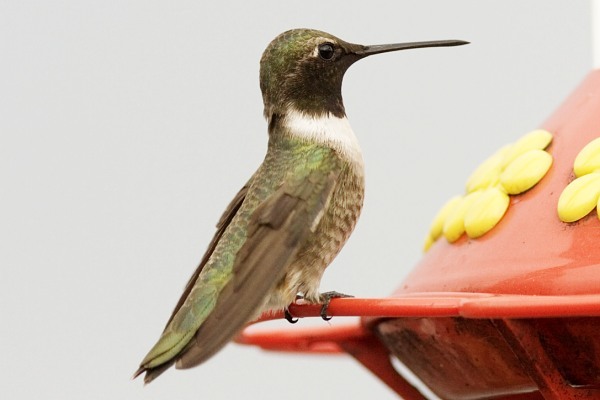 When the hummer visits another flower (not a feeder!) cross pollination will occur. The flower uses nectar to get pollen transport. All About Birds at Cornell Univ.